The Dark Gathering, which has been recently described as Cornwall’s Annual Halloween event, has almost outgrown itself in popularity. Sometimes I think that folk forget that Boscastle is a small fishing village and treat it like a town in some ways. The locals do their level best to accommodate most people’s requirements and I feel that this needs to be remembered when visiting, whether as a performer or an audience member. In a town which holds Morris events for instance, the teams are able to spread out more and there is a relaxed atmosphere regarding timings. At the Dark Gathering however we have to stick to timings as we don’t have the necessary permissions to block the highway for too long. The marshals are local volunteers and are trying their level best to help everyone safely across the road when it comes to the Procession. There are literally hundreds of people who follow the Mari Lwyds down to the Museum each year and it takes some management. Normally what happens is that there is a small group of performers leading the way with flaming torches. This makes sure that the Procession moves at a, well… processional pace, suitable for everyone to appreciate the Mari Lwyds and the music. These torches also are a visual aide to us folk waiting at the Museum to start the tribal drumming. Due to a miscommunication/misunderstanding this year, the torch bearers were absent at the crucial time and the Procession left without them. At the head was the redoubtable Cwmni Gwerin Pontypwl sweeping and practically galloping down to the harbour with everyone valiantly trying to keep up! and bringing up the rear, Mari Arianrhod. If I’d had been forewarned I could have got Steve Podger our MC to do an animated commentary to accompany them. In fact, we could have taken bets… No! It’s not going to happen again because we have had our heads together in the Stewards Enquiry and come up with a Cunning Plan! Prior to this Penkevyll the Land’s End Oss had heard the mesmerising and irresistible tribal drums which heralded her appearance – but this year she sent out her apprentice Teazers first to surprise the onlookers – I don’t think anyone was expecting that! Penkevyll had no sooner emerged when we were startled to see the Mari Lwyds had already arrived on the bridge. Thanks to our trusty Gatekeepers who kept them at bay, Penkevyll was able to claim the performance space and danced and frolicked with her Teazers for a while. Then it was time to greet her guests who had travelled all the way from Wales to see her. Then it was time for the Pwnco ceremony. The Welsh contingent were in good voice for the Pwnco, and Laetitia responded wonderfully in West Cornwall dialect until eventually the Mari Lwyds gained entry to the Museum of Witchcraft & Magic to give their annual blessing. Meanwhile outside a dramatic visitation was occurring. Suddenly the sound of war drums was heard in the still night air and, surrounded by flaming torches Tre War Venydh marched down the hill in style! The local warband were led by the redoubtable Chieftain Sigewulf. Well, I wouldn’t want to fall foul of her – would you? She went on to introduce her warband by name and character with an edgy humour. The crowd were then encouraged to support their favourite warrior as they were pitted together in mortal combat. This was rather alarming at times because these were real swords and axes – not a rubber or resin sword in sight! The fights were very exciting and there was a lot of cheering as each blow thudded on the combatants’ shields. Finally one of them was vanquished by the other warrior and fell to the ground. The wisewoman and magical healer performed remarkable feats by restoring the warriors to health following their demise. The re-enactment ended with a demonstration of a shield wall in action. During all the excitement, the Osses and Mari Lwyds had re-emerged into the night. This included the young Oss, Morvargh, who was up way past her bedtime! It was at this time that the atmosphere of the Dark Gathering shifted. We sensed the Ancestors were drawing near… the dark. quickening time approached. At this point Sarah Emery appeared to sing the now traditional lament at Summer’s End. This year she sang the haunting Traveller’s Prayer. I then stepped into the space to give the Ancestor Blessing. This was a role that Will Fox usually performs but sadly he was unable to be with us this Gathering and so it fell to me to fill the gap. I was wise enough to not even attempt to emulate Will’s unique style but simply went with the energy of that night and talked about the ancestors and what we can learn from them. I don’t have much recollection of what I said, but apparently I did alright judging by the feedback later. I ended with calling Sarah back to lead the singing of an Ancestor Chant, accompanied by Chris Neno on the drum. What followed was an utterly amazing experience that folks talked about for weeks afterwards. Here are some excerpts so that you can get a feel for the power of this chant that resonated around the valley on that Dark Gathering night. It was thrilling to hear so many people singing and harmonising together with swaying and stamping their feet to the rhythm. So powerful. So evocative. Laetitia found the Ancestor chant online for me as I was searching for something that everyone could join in with that was universal and of no particular persuasion. She certainly fulfilled the remit when she found this. That was it. All over for another year. The performers trailed off to get some food, ale and have a knees-up and I would imagine the audience made a bee-line for somewhere warm and sustenance also. 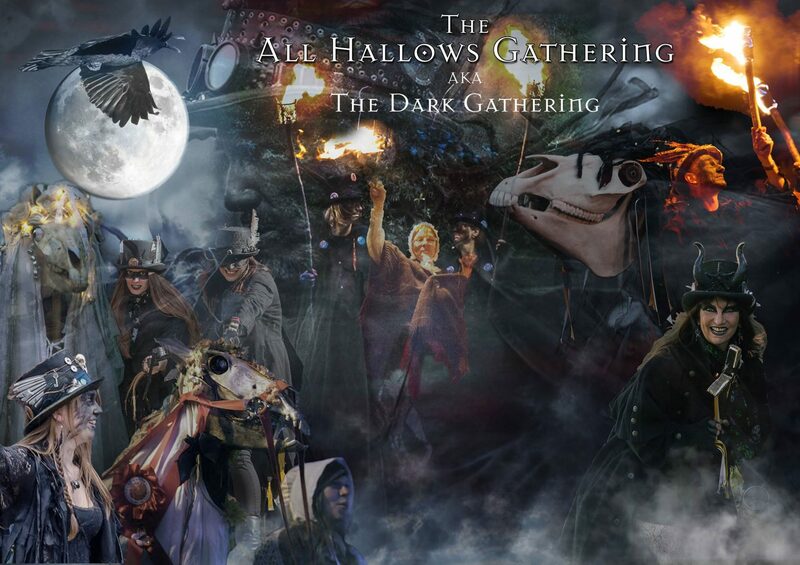 The next All Hallows Dark Gathering will be held on Saturday 26th October 2019. We’ll see you all there! Wow! You really recapture the energy of that night Cassandra! What a roller coaster ride. Even when some bits go a bit wrong, others go spectacularly right and leave an after image in memory that can pass into legend and fond retelling for years. That fire dance! :O The gods always seem to smile on the Dark Gathering and, though we never take it for granted, it’s good that they show their appreciation too. I don’t think I’ve ever seen such enthusiastic, unbiased and joyful enjoyment of paganism. There’s a wonderful feeling of openness and sharing of an ancient celebration of firelight in the cold dark, of voices raised together and the energy of dance and music that calls down the millennia and, while the speech may change, it’s probably the most superficial part of the whole event. This emotion we raise gathering in the dark together at the bottom of the year is surely unchanged. No wonder it feels so special to us. It calls to our hearts and it seems to have a need of its own too, to be born out of the cold night by torchlight and beating feet.